The NDS or Nintendo DS is a portable gaming device that replaced the aging gameboy systems that have been around for quite some time. 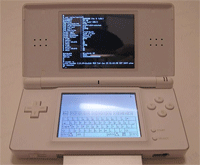 The NDSi (Nintendo DSi) is a newer version of the gaming system that features incremental upgrades to its predecessor. Probably the most significant and certainly most visible difference between the two is the addition of two cameras; one on the hinge while the other is on the top cover. The external camera can be used to take pictures that can be edited and shared while the internal camera is intended to be used in games as another means of intuitively controlling the device. A prime example of the use of the camera is head tracking, where the display would change depending on the position of your head in relation to the screen. Another change from the NDS to the NDSi is the disappearance of the GBA card slot. This card slot allowed the NDS to play older GBA games and is also used by other game accessories; the most notable of which is the Guitar Hero: On Tour attachment. The loss of the GBA card slot and the huge number of nostalgic games is slightly offset by the now slimmer and lighter body of the NDSi. It can fit easily into your back-pocket, making it ideal for gaming on the move. An improvement that seems to be very minor is the increase of the screen from 3 inches on the NDS to the 3.5 inches of the NDSi. It might not be a big improvement but any increase in size is absolutely better. The increased screen size negatively impacts the battery life of the device though. The bigger screen consumes more power, thereby draining the identical capacity battery faster. Reducing the brightness of the screen should improve the duration but it is still no match to the NDS given identical conditions. One major drawback to the NDSi is the significantly higher price at which it is sold at. The addition of the cameras doesn’t seem to justify the much higher price. More so since little else have improved on the hardware. Ben Joan. "Difference Between NDS and NDSi." DifferenceBetween.net. April 25, 2010 < http://www.differencebetween.net/object/gadgets-object/difference-between-nds-and-ndsi/ >.